Because no one reads the newspaper, and SportsCenter's anchors are too perky for this early in the morning, Deadspin combs the best of the broadsheets and the internets to bring you everything you need to know to start your day. 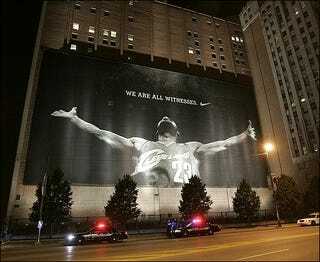 •Like the giant statue of Saddam Hussein pulled down in Baghdad, fans gravitated towards the giant LeBron James billboard downtown, only to find it guarded by police. Angry Clevelanders will just have to destroy their city the old-fashioned way: a long slow economic decline marked by the departure of industry and a sustained flight to the suburbs. •Meanwhile, on ESPN2...The Major League Lacrosse all-star game went off without a hitch, with nary a Jim Gray in sight. Team USA scored the dramatic go-ahead goal with a minute remaining, and TV ratings were probably impressive because, let's face it, if you're watching MLL, you've probably divorced yourself from mainstream sports long ago. •The NBA's a confusing, confusing place. Free agents' current teams can offer more, because in Stern's head, this is an incentive to stay with one team. So they invented the sign and trade. David Lee is heading to Golden State for a forward potpourri, and he's going to be making more money, and for longer, than LeBron. •Hope you haven't stored your righteous sports outrage away for the summer yet, only intending to retrieve it from the closet when Roethlisberger returns to play. Reports have the Yankees as clear front-runners to land Cliff Lee from the Mariners. Six quality starting pitchers? Why, that excess could only be compared to a hypothetical situation in which one basketball team signed three max salary players! •Ubaldo Jimenez became the first pitcher to win 15 games before the All-Star break since — you'll never guess — David Wells for Toronto in 2000. Wells "only" won 20 that year, but comparing silhouettes, I don't think Jimenez will have any of the same conditioning and stamina problems. Good morning. Does everyone feel a little dirtier today, or is it just me?